Glitter Nails for the #31DC2017Weekly - Polish Etc. I have a quick little purple skittlette manicure to share with you all today. I combined some textures and glitter placement for this look. It is quite simple but still gives a cool effect once it is all put together. I think a lot of ladies use glitter placement for this prompt in the challenge. I know I usually do! Again, I used all Zoya shades for this manicure. The dusty purple textured polish is "Stevie" which is one of the original Pixie Dust shades and one of my faves. The lavender creme is "Abby" and it has a amazing formula. Then the white creme with "Purity". I used some craft iridescent purple hex glitters for the heart shape. I free hand placed each of the glitters so they aren't perfect. But you can still make out the shape of a heart (hopefully!). Simple but cute. And I always love doing skittlette manicures. 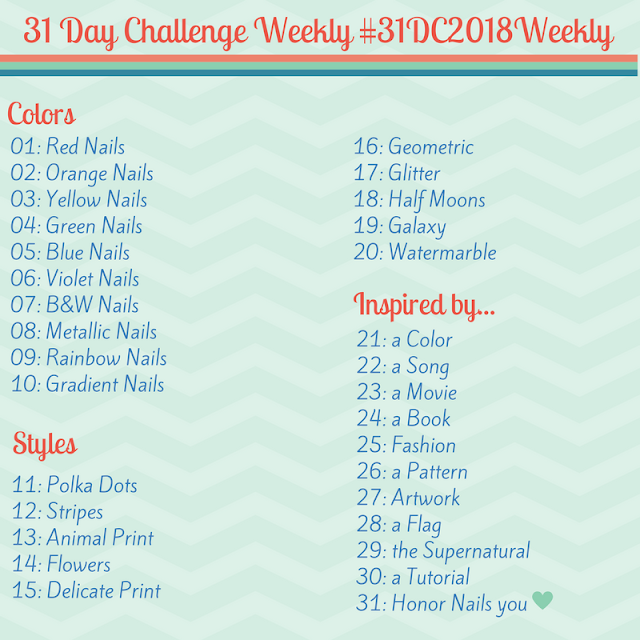 Be sure to check out all of the other participants in the challenge under the tag #31DC2017Weekly on Instagram, Facebook and Twitter.